Maintenance Of Your Precision Stage | Reliant Systems, Inc.
Reliant Systems stages are designed to provide years of accuracy and trouble-free performance. Routine cleaning and lubrication is recommended to ensure full life expectancy and reliability of equipment. It may be necessary to complete maintenance service more frequently depending on the duty cycle of the stage. 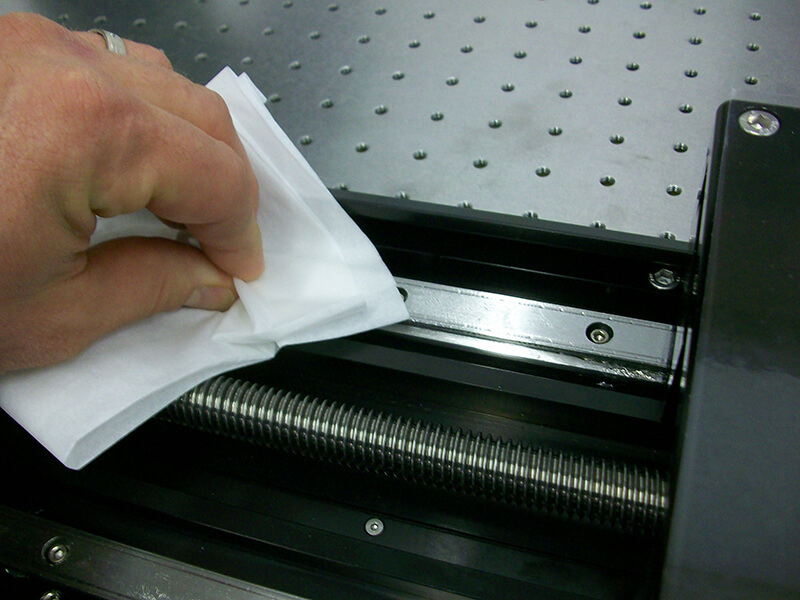 RSI recommends that each axis of the assembly be run through the full motion periodically to redistribute the grease. The following is a general maintenance plan for linear stages. Contact Reliant Systems if you have any questions on the proper maintenance of your specific precision stage. Keep in mind that these stages are aligned to precise specifications during factory assembly. 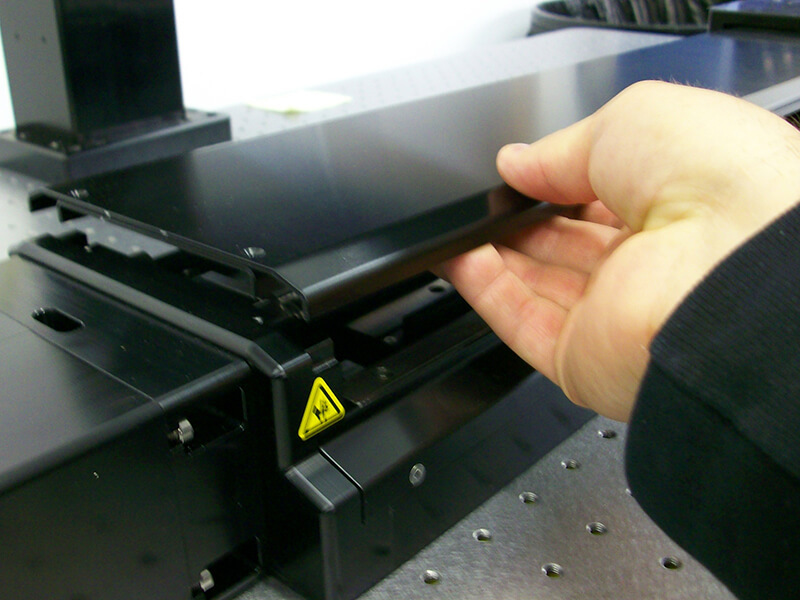 It is not recommended to remove the top plate or separate the axes of an XY assembly. 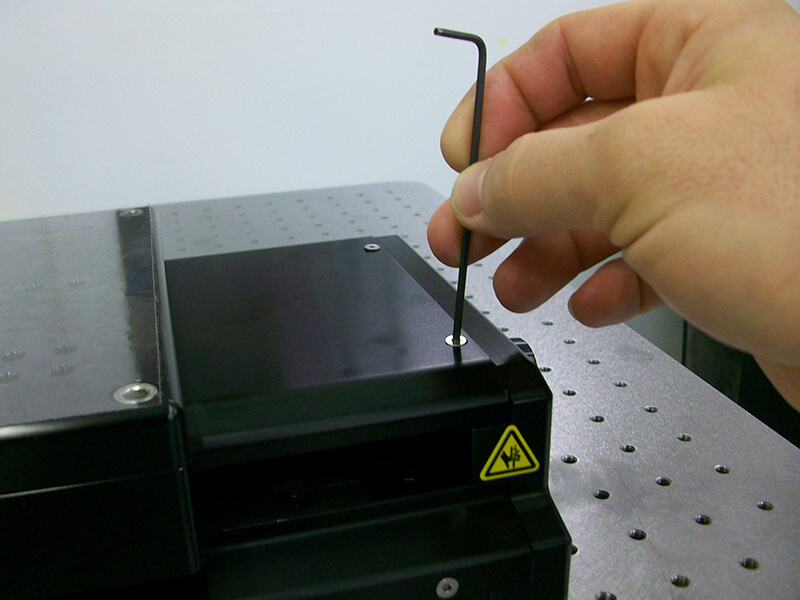 If the top plate or axes are separated it may be necessary to return the assembly to RSI for realignment. Prior to servicing the stage wipe the external surfaces off with a lint free cloth to remove any dust or debris. To access the components of the stage the covers may need to be removed. The covers are designed for low clearance, use extreme caution as to not bend or twist the covers during removal. Be sure to retain the orientation the covers are in for reinstallation. With the covers off, remove any foreign objects or debris from the inside of the stage. The bearing rails and drive screw need to be inspected for damage and corrosion. Most RSI products use stainless steel components, reducing the concern for corrosion, however it is still wise to look for this. Consult your sales representative if you have any concerns. To service the stage, it is necessary to drive the stage through its range of travel. This should be done manually to prevent injury or damage. The components need to be wiped clean prior to installing new lubricant. Use a lint free cloth to wipe old grease from bearing rails and drive screw. Reagent grade Isopropanol alcohol (2-Propanol) may be used to help free dried or old grease. Be sure to dry thoroughly if cleaning with alcohol, alcohol may leave traces of moisture. It is not recommended to use any harsher chemicals as they may cause damage to seals. Each axis is provided with a lubrication label specifying the type of lubrication used and what component it is used on. Manually drive the stage or top plate to one end of travel. Apply a light coating of the correct specified grease to the rails on a truck and rail system, or a thin coating of the correct specified oil to the rail v-groove on a crossed roller bearing system. A lint free swab works well for this. Drive the stage or top plate to the opposite end and repeat the process to lube the rails. 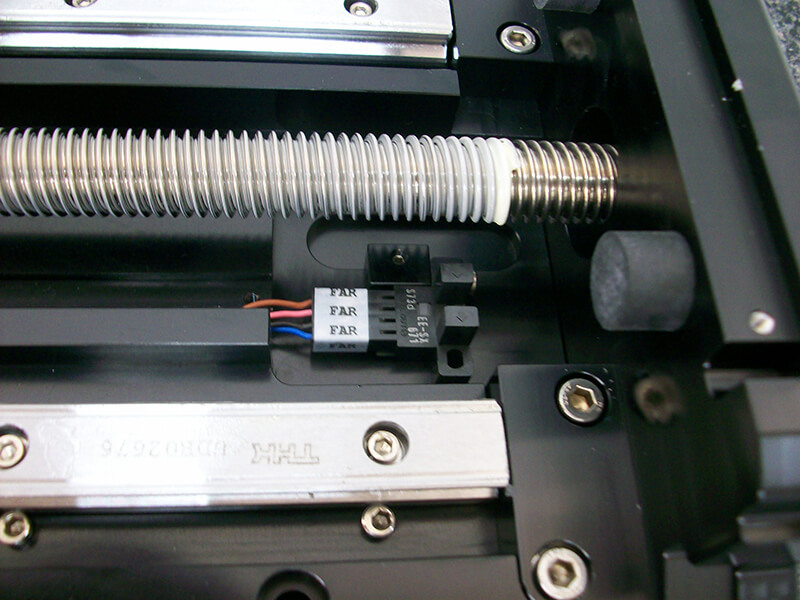 To clean and lubricate the drive screw, manually drive the stage or top plate to one end of travel. 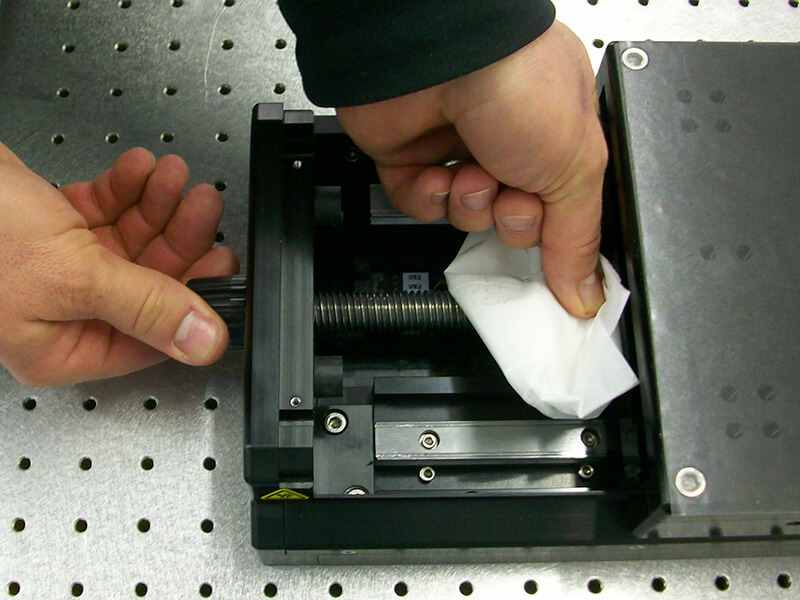 While holding lint free cloth on drive screw, manually rotate the screw and allow the cloth to travel along the screw. Do this in both directions to ensure drive screw is completely cleaned. 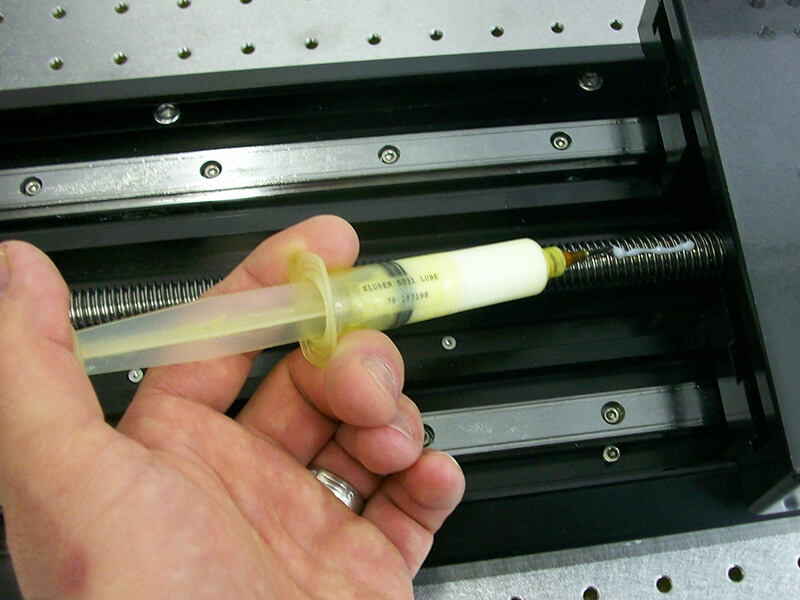 Apply a bead of the correct specified grease along full length of travel on the drive screw. After applying the new grease, drive the stage through full range of travel to work the new grease into the drive screw nut. Wipe any excess grease off at the end of travel. Reinstall the covers by carefully sliding them in following the orientation they were removed. Install the fasteners. Manually operate the stage to ensure that the covers do not rub. If needed, loosen the fasteners and adjust the cover. Retighten the fasteners and check the clearance.